It's not from Venezuela, but from Senegal: Baobab. The Senegalese music was greatly influenced by Caribbean music (mainly Cuban, but not only), which in turn was the product of African music with an European touch. I had the privilege to talk to a couple of these musicians. They are not just brilliant but also extremely friendly. Here you see a BBC video on Caracas' crime. The BBC journalist Jonathan Dimbleby (which I wrongly took for Will Grant) goes around with the Caracas policemen in one of their night patrols. At the beginning of the video Dimbleby says there has been over 17000 murders in Caracas last year. In reality the number should be for all of Venezuela. This blog has a lot of posts about crime. I know the level of violence and lawlessness in Venezuela just horrible. Still, I find it is a real pity a journalist from such an organisation as BBC juggles in such a careless way with numbers. If you want to see a more careful report on crime in Venezuela, you can check out an old post by Rory Carroll, who did deliver a good picture and a more in-depth analysis. Rory used the low range (14000 plus) but he correctly refers to the country, to the city, to ratios and to the fact stats in Venezuela are usually a mess. Perhaps the journalists from the BBC could learn a bit from him. Ps. I still find it annoying they don't send a BBC journalist who speaks some Spanish. After all, Spanish is the second or third most widely spoken language on Earth...and it is not as if Spanish were so hard to learn for someone whose mother tongue is also Indo-European. 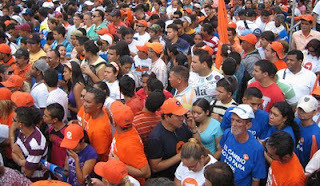 The event was on Tamanaco street of El Rosal, a rather small venue, but then again it was not a mass rally. Indeed, what I attended was a rally of the faithful, of dedicated people who in two years managed to cobble together a political party and get a candidate with world wide exposure as the guy that took on Chavez in-justice system, and won. Well, won the credit anyway, the material victory still up in the air, depending on whether Chavez will risk blunt repeal of the IACHR. The rally must thus not be judged on the extent of the crowd but rather on the enthusiasm. 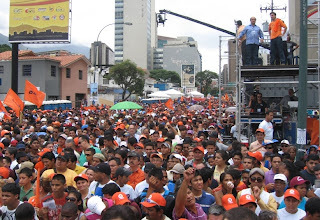 After all it was Leopoldo speaking to the faithful and a turn out of several thousand (maybe 5?) was good enough as long as they were all cheery. They were. My first observations as slowly but surely I made my way to the stage were on the very mixed crowds, clearly cutting across social lines,and, shall we dare to write it, racial lines. I think chavistas must be starting to feel scared that so many of what passes for its captive electorate is now showing up at opposition rallies. 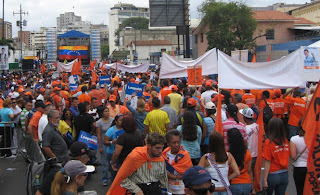 In fact, it almost felt like a chavista rally of years ago... I am including a few shots of thew crowd for you look by yourselves at the great mix of folks. And as usual, by the way, click to enlarge and get the details. 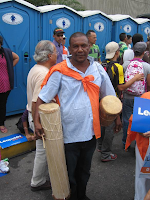 The atmosphere was festive indeed, with plenty of interesting folks to look at such as this drummer from Zulia? Barlovento? I did not ask, too much noise already. Elsewhere folks organized impromptu dancing, or something. But the atmosphere was also festive in a different way when I finally climbed on the "VIP" stand: plenty of opposition figures were at hand, from all colors (except Primero Justicia who should start getting over the desertion of Leopoldo by now). There was the mayor of Baruta, Gerardo Blyde, UNT. There were several Assembly folks (Cocchiola of Valencia, Stalin of Caracas, etc..) and even another candidate, Diego Arria. Apparently they all came not only for courtesy but to show the strongest support to Lopez in his fight against the regime in forcing it to abide by the IACHR ruling. The view from the grades was good enough and it helped me accept the fact that once up there, I could not escape until the speeches were over. But in the end I did not mind, the allergy that I developed to political speeches under Chavez turning out to be a Chavez allergy. Leopoldo does not do small talk. 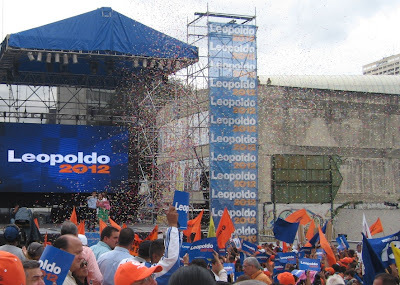 The show started with a long motivational video that reminded us all the troubles of Leopoldo and the program of VP. Well done, with proficiency. As the array of cameras held by long beams roved all around to film the crowd and its reaction. VP seems to have the means to rent stuff now. Or is it that Venevision is trying to make a come back by helping Lopez, as rumors have it? At this point I really do not care as to who finances whom now, the time of virginal politics is long gone and anything is good enough to get rid of Chavez, who on his side has absolutely no qualm in using all the state apparatus and finances for his campaigns. Let's keep that in mind, shall we? Leopoldo made his entry after the video, alone with wife and daughter. Big ovation, and then he was alone on his pulpit (seen above, as I went backstage at the end). His speech was really more geared at the press and public opinion than to his followers and thus there was a an occasional lack of synchronicity between Leopoldo's sometime fancy words and the reaction of the crowd. Thus not as much roaring as I was expecting (though it started well when Leopoldo repeated his "Chavez, are you afraid of me?"). Or maybe it was some lack of experience yet: after all Leopoldo has been building VP almost one to one and only now he is starting to address larger rallies. There is training curve, even in politics. But besides this qualm of mine, the speech was solid, maybe with a couple of unnecessary and untenable promises but with other strong points that really had an impact. 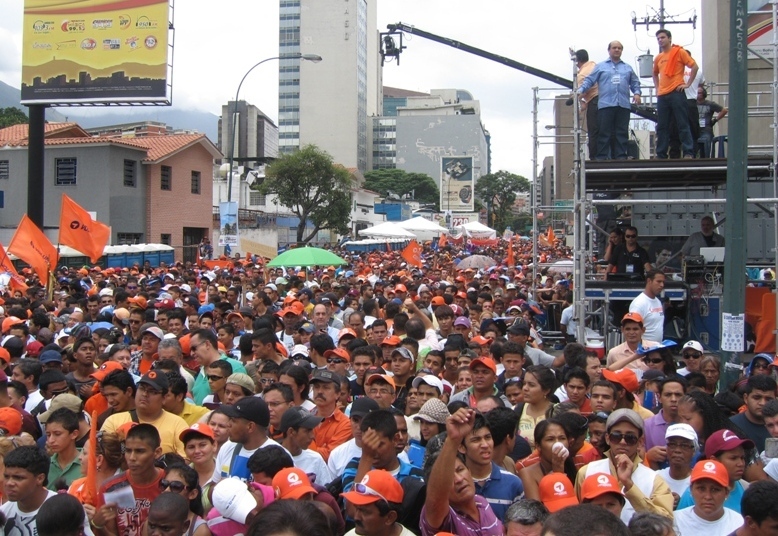 The first one is the announcement that Leopoldo Lopez, if elected, will be a one term president, will seek to go back to the traditional one term presidency of Venezuelan democratic history. This is big for me because Leopoldo has indirectly admitted that an eventual governemt of him will be plagued by hard decisions and as such he is already aware that reelection will not be possible. I like very much that realism as to the Venezuelan situation. I have to praise him for an almost self offering as a sacrificial victim. This is a statesman speech such as they are woefully lacking among other candidates, as I already noted. The second highlight was the real show stopper, the roaring moment. That came when Leopoldo addressed the injustice now prevalent in Venezuela and he must have touched a raw nerve with the attendance. Indeed, even though he has become himself the poster boy of those who have no option but seek justice outside of Venezuela, it is also true that chavismo abuses are now having a toll at all levels. 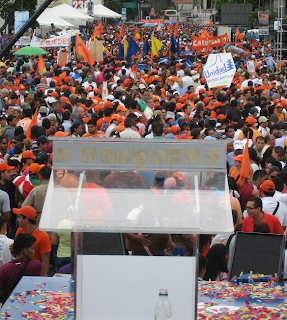 Not only the abuses of the public workers who now are unaccountable of their actions, but also the everyday abuses by chavistas at the Communal Councils, or the Reserva, must be hitting a lot of people in the crowds that attended today. Amen of the utter lack of justice for the victims of the high crime rate of Venezuela. VP could do worse than have its focus group centered on this. Once the speech was over, in good US style, a confetti rain fell over Leopoldo who was joined again by wife and daughter. 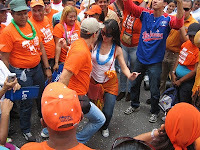 After that Leopoldo got down to press the flesh, something he has got excellent at, what he does best in fact. I even made a short video of the moment. Yet Arria had no qualm talking to that guy and keeping his cool. Still, a couple of minutes later some woman started bitching at them. I am sure she will be on VTV but not Arria who did not say something outrageous (for their taste). 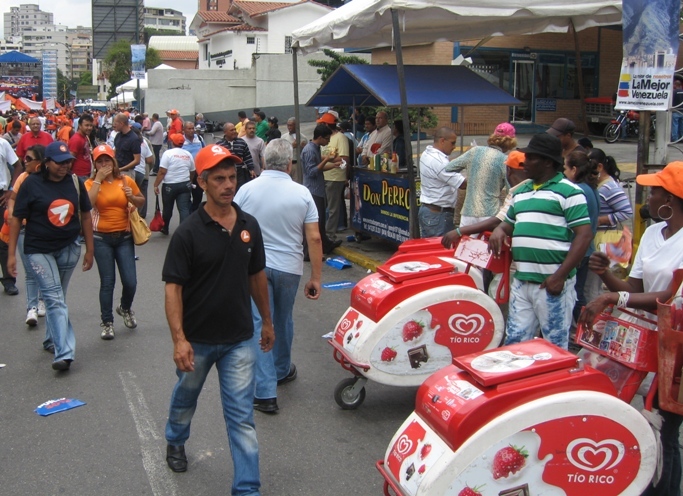 While the women bitched, Arria was calmly buying an ice cream cone to a street vendor and I went to talk to him. Maybe another political event for VN&V to cover soon? Venezuela is not getting the money it should get from the the oil industry because PDVSA is in bad shape, corruption keeps growing and the president, who rules Venezuela as if it were his personal farm, is ill...or terminaly ill, or faking to be ill, depending on whom you ask. We read that Akhmadinejad is not coming to Venezuela because Chávez is too ill (his chancellor, Maduro, said it is "waiting a few weeks for the completion of the healing programme". The country is experiences protests everywhere. People protest and often don't know what their ultimate plan is. They want the State to help. Sometimes they want security, which is very much their right. Sometimes they want help in social housing, which is very much fair. Sometimes they want houses for free, which is not stupid and can only be possible in a place where most follow a cargo cult. Sometimes they want the government to improve their conditions that deteriorated after some of them asked the government to privatize their companies. Sometimes they are fed up of the way in which health services are collapsing. A lot are angry because blackouts and general electricity shortages are our daily bread. People close streets everywhere, burn tyres, make a lot of noise and the ones who suffer the most are other civilians. The mood is bad. The honchos in power are fine. Daniel wrote about how the government wants now to limit profit in Venezuela to 10% while that same government is overpaying Nicaraguan and Iranian and Chinese exporters for political reasons. Inflation is almost 30%.The IMF predicts GDP growth of 2.7% and the Venezuelan government annouced that as a big achievement, but that is only because most people don't know how to interpret GDP growth. Venezuela has a population growth that is almost 2%, it has had over 15% more revenues due to higher oil prices since 2010, it is the slowest growing country in South America. You can't compare 2.7% of Venezuela with 1% for Germany. What can you expect in the coming three months? 1) the Chávez honchos are again increasing the personality cult around Chávez. This will reach even more mental levels in the coming months. 2) more money will flow from Fonden and other state resources to the Chávez campaign. 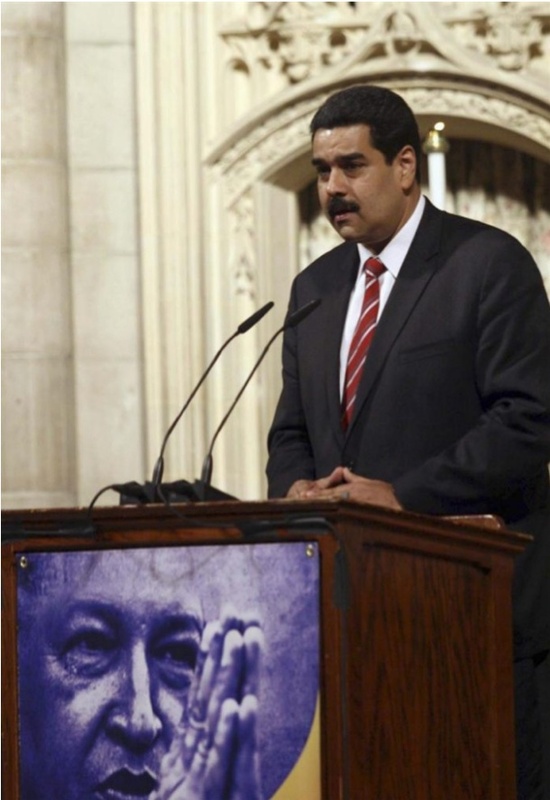 3) the regime will put more efforts on trying to use Leopoldo López to divide the alternative forces. At the same time we will see an increase in the competition between the different pre-candidates for the opposition. If this is carried out in a fair manner, it could benefit democracy in Venezuela. If not, obviously, we will have more military government to come. Expect Russia and China to meddle more and more in Venezuela's affairs. Venezuela means too easy money for them. The Chinese can become more flexible when it comes to accepting a regime change. 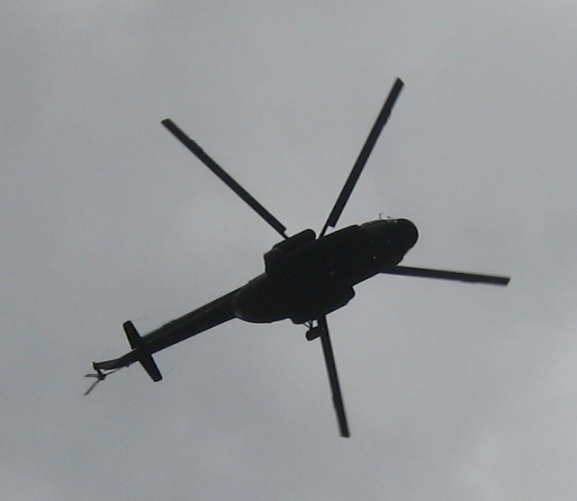 The Russians know they will lose one of their best buyer of weapons. As the CEO of Rosobonexport, Anatolii Isaikin, declared, Venezuela was one of the five countries on which the Russian merchants of war count, together with huge China, India plus Algeria and Vietnam. The thing is that Edmée thinks that 10% earnings is quite fair. “Todo esto se tomará en cuenta para poder estimar cuál será el precio máximo de un producto. Por supuesto que habrá un precio determinado de un producto en la matriz de costo. A partir de allí es cuando se fija cuánto será el precio máximo al público. Yo opino que una utilidad razonable de una empresa puede ser de 10%”All will be taken into account to determine what will be the maximum price of a product. Of course there will be a determined price of a product in a cost matrix (WTF ????? Editor's note). From there it is that we will fix the maximum price to the public. My opinion is that a reasonable earning for a business could be 10%. That you sell a million trinkets or half a dozen heavy machinery in a year, 10% is fine. That the inflation of a country is 30% does not matter, obviously. You can absorb the 20% loss of capital. That banks could pay me more than 10% interests should not be an incentive to sell my business and put the money in the banks. My nature forbids me to endorse anyone in politics, or at least not heartily. Mostly all my voting decisions have been difficult, in France or Venezuela (or the US if I had been allowed to vote then). Only since 1998 my head was clear, my decision neat and precise: anything but Chavez, at any election that this creep or his minions or his referenda were proposed. My record low, so to speak, was April 1999 when I was in the 10% of those that voted against electing a constituent assembly. To this day, the only true anti chavista and possibly the only true democrats in Venezuela are those who went to vote NO that day in spite of Chavez rising tide or the first "abstention" movement of our recent history. I recall my last minute frantic call to convince at least my brothers to go to vote NO, only one did..... That I have been proven right since is of little comfort. Since 1998 all my voting decisions have been based on which way is best to get rid of Chavez who has been a cancer on the country (kind of interesting that he is suffering of cancer himself and that he uses it to screw Venezuela even further as if it were our fault he got cancer; but I digress). In other words, I will support, heartily, anyone that has a reasonable chance to oust Chavez through the ballot vote, the only way we should remove Chavez from office if we want to avoid lingering peronista-like syndrome for Venezuela. In 2002 a more or less forced destitution was still an option as Chavez then was at his historical low and there was an argument that the 1999 constitution changes were illegal. But such an option is ruled out today now that the regime as managed a permanent polarization of the country and has created an ideologized group that will take years to educate back to the ways of democracy. Now, mere application of the 1999 constitution would be an improvement over the present situation. The first real choice we had was in 2006 when we had to chose between Petkoff, Borges and Rosales as the unity candidate against Chavez. My choice then was Petkoff even though I did write a lengthy article on the validity of the three choices offered then. Once Rosales got the opposition nod I endorsed him fully which alienated me, for good, from one of my colleagues that had soul searching misgivings only well suited for those who have the luxury of living abroad. Warts and all we had all to support Rosales. The situation today is different since there will be primaries in February and in theory we can chose the unity candidate and my blogging could actually play a role, the tinniest, smallest, role for sure but a role in supporting a given horse. And even though I have written extensively about Leopoldo Lopez plight, that should not be interpreted as an outright endorsement. Let me explain first one thing: the tale on how Leopoldo took on the chavista judicial repression machinery and exposed it to the world, and even to too many Venezuelans that should have known better, is riveting, to say the least. I would be remiss if I had not covered it in detail. After all, other colleagues were writing on fiances and fraud, someone had to cover the story from early on. This being said I do have three candidates for the primaries. If they were today I would vote for Leopoldo but I have not closed my options on Maria Corina Machado or Diego Arria even though I have all but ruled out Capriles and Pablo Perez. Let's start on why I have ruled out Perez and Capriles. There is something that I do not like in their campaign, a feel of "chavismo light", a belief that chavistas could come to them just because they promise to keep the best of Chavez and make it better. The premise is wrong on so many levels that I do not want to get started on that. The main sin for me of these campaigns is that they are doing great disservice to the country by sugar coating the reality and waltzing around the tough decisions to be made in 2013. It is almost the best recipe to send people back in droves to Chavez or some chavista, just the way they did go back to Carlos Andres Perez in 1988 for all the wrong reasons. Nearly unforgivable for me there are the many mistakes along the way such as the long drawn out discussion between Perez and Rosales, or the twitter major faux-pas of Capriles. It is not that I do not like them, after all I did write a rather glowing review of the a Primero Justicia congress, and I have more than once apologized for Rosales missteps. But this time I have a choice. I regard Lopez, Machado and Arria as my favorites right now because each one of them is doing what is right, what needs to be done if we want to do more than just beat Chavez in 2012. Diego Arria has probably no chance and he has to suffer to get his 100K signatures so that the MUD will let him run as an independent. But he is the perfect president for a transition that will last at least a couple of years, when the new government will need to negotiate tough agreements with all sorts of countries that have screwed up Venezuela and that will demand payment. After all, they signed with Venezuela, not with Chavez, and it is not their fault if we were stupid enough to put Chavez in office. Diego Arria has the experience for that and the contacts. And he also understands that micromanagement does not work and he will hire the people to do the job wherever they are needed. I sense that last part from no one other candidate except a little bit from Leopoldo Lopez even though many accuse him of autocratic tendencies of his own. 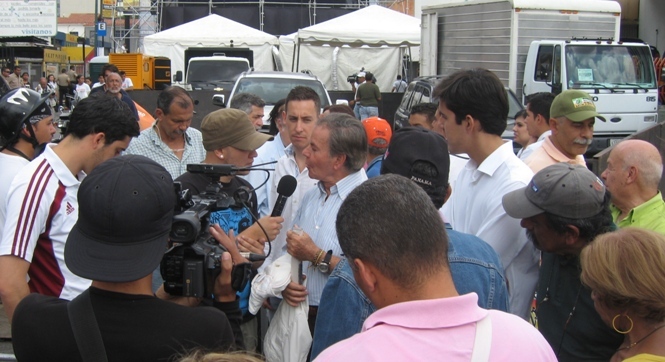 And if you think that I did not cover Diego Arria, think again: I covered extensively his fight to preserve his farm and his principled position against the regime (which did not do him much good). Maria Corina Machado has already proven herself to be a good political manager when she was at SUMATE. Since she is at the National Assembly she also has proved that she is a political animal, not a perfected one yet but a very fast learner. And even though I covered her less than Arria or Lopez, I have dedicated a whole blog to the survival fate of SUMATE, a blog that may be mercifully dormant but ready to restart as needed. Also, she speaks her mind and is not afraid of often saying stuff that is un-PC. Never mind that her rather Quixotic campaign is serving at least a major prupose: exposing the machismo inside chavismo where women occupy high positions but rule over nothing. Leopoldo Lopez is easier to explain since I have done a lot of coverage on his adventures lately. However I need to insist that he is doing something right too, creating a political party from scrap, which included extensive participation from its followers. True, Primero Justicia does it also but not at all to the level that Voluntad Popular has dared to do. As such Voluntad Popular has had the benefit of attracting a lot, a whole lot, of the best and brightest of that student renewal that we saw in 2007. Look at them then and look at 70% of them today organizing Lopez political activities. Today, as I wrote, I would vote for Lopez but Arria and Machado I keep following and I can still go for them. There are three long months of campaign and any one of the three can start failing... or be barred from running. In fact, since either Machado and Arria are collecting signatures and since Chavez will likely bar Lopez, I might not be able to vote for any of them! Speaking of this, since I consider that it is important that Machado and Arria go all the way to February to move the debate away from the "I am more efficient than Chavez". I will urge you to bring your signature to Machado or Arria. Either one and you are not obliged to vote for them, but please, make sure they do participate in the February vote. Since this is internet you can help Arria by going to his special Facebook page where you can download a form to support him and send it for free if you are in Venezuela. I think that since the Tascon List this is a hard way to go, but if you live outside Venezuela or your name is already on the Tascon list, what do you have to lose? Same thing for Maria Corina Machado who has a slicker web page. She gives you the option to download a form and mail it or a list of points where on occasion volunteers collect signatures. And you can also mail them for free. Still, to conclude, I need to re-assure readers who follow other candidates that if Capriles (you know who you are) or Perez win the primary this blog will instantly serve their electoral effort as if I had rooted for them from day one. I have to say Henrique Capriles' efforts on education are starting to pay off. Whereas the military government in Venezuela is focusing on buying weapons, Capriles, who is a candidate for the 2012 presidential elections and current governor of Miranda, has been concentrating on improving schools in his region. It hasn't been an easy job, specially as the national government has been sabotaging all it can. I have been personally involved in promoting the PISA programme in Venezuela. The Chávez government has ignored repeated calls to bring Venezuela to PISA as this would bring quite some transparency to Venezuela. It has been a frustrating thing to try to convince Chávez functionaries about allowing an open debate and research on education quality. The Miranda government, on the other hand, decided to meet the challenge and let pupils from Miranda take part in this international evaluation programme, just as most other American countries and other nations are doing. Very soon we will get the results for Miranda's pupils. I imagine the initial results will be poor, but this is no surprise as Venezuelans' school levels were among the lowest in Latin America in 1998. The very low education levels in Venezuela were one of the main reasons, together with the oil price cycle, why the military came back to rule Venezuela in the first place. But now there is a new development. Very soon we will see how the central Venezuelan region of Miranda compares with the rest of the world...and we can build upon that and very soon all Venezuelan pupils will also join the PISA project. On the internal front Chavez is aware of his personal weakness, even if he acts at it as if he were not seeing the white elephant in the living room. He knows he could get really sick suddenly and he is trying to secure his hold on power. But his problem is whom to trust. From what we see it does not seem there is anyone he can trust, even in sickness. People are pushed on and off from the front scene while he retains Jaua as his vice president. But the latest promotion of his foreign minister Maduro who has started doing all sorts of things except foreign-ministering seems to point out that he will be the next Vice President and thus the one in charge shall Chavez weaken further. This is strange, that a civilian may get the nod, because on the other hand Chavez keeps increasing the military hold in public administration. Venezuela looks and works like a military regime now and that Maduro might be the next in line were Chavez to falter is curious to say the least, almost as if Maduro was his own less bad choice. The Maduro/Military possible contradiction is an example where Chavez should make a choice and does not. But when he makes a choice it might even be worse for him. The very latest one was him declaring Saturday that the Inter American Court is worth nothing. 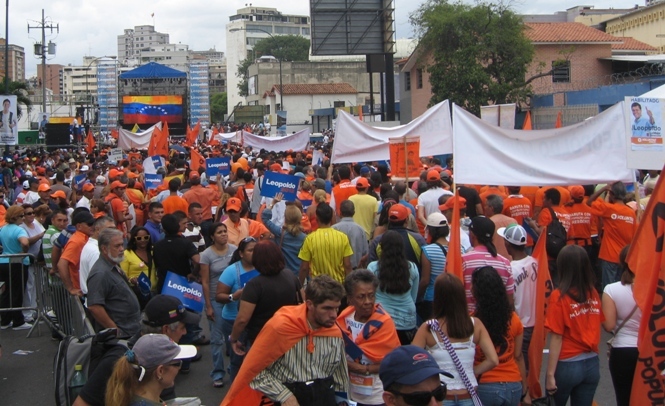 That can only mean that legally or illegally Chavez will bar Leopoldo Lopez from running in the 2012 elections. Politcally one cannot understand his motivation. Capriles Radosnki is leading high in polls for the February primary. The second one is Pablo Perez. And Lopez is a distant thrid. Even if that distant third could be improved readily if Lopez were to be allowed to run, it still does not imply that Capriles will lose in February. It is in Chavez political interest that whomever wins in February does so with less than 50% of the vote and the best way to do that is to let Leopoldo run. I doubt that he could go above 50% by February even if he were to win as either Perez or Capriles are bound to make further alliances to push away any challenge to their now established leadership, even if theirs is rather locally based. 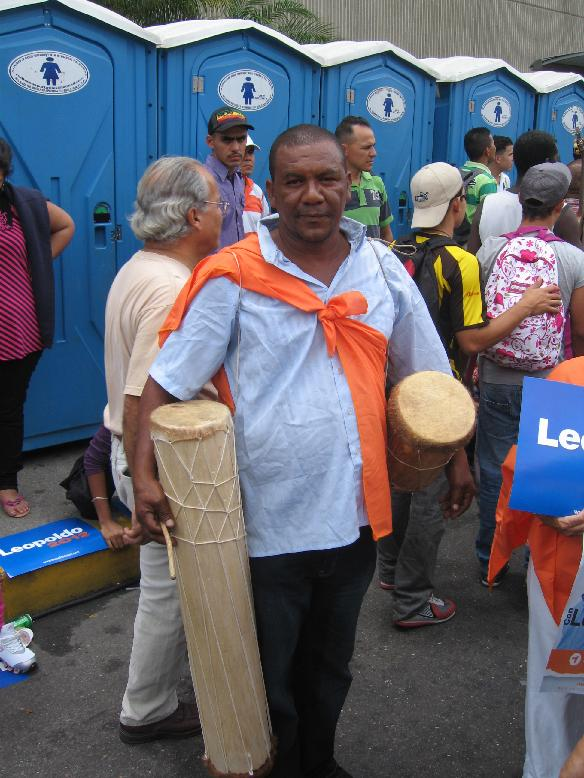 A Lopez banned from election will be forced to support either Perez or Capriles, become the king maker and ensure that whomever he picks up will win handsomely in February. Does Chavez needs a real unity candidate? Can Chavez personal hatred of Lopez blind him so much? In fact I will go as far as suggesting that Chavez would have an easier time to beat Leopoldo than Capriles or Perez in October 2012 as these ones can probably rally better the left overs of AD or COPEI around their names than Leopoldo can. And thus we must conclude that Chavez is adrift, hitting here or there, depending on whatever medication or treatment he is receiving at a given time. While the country crumbles without him worrying much. And him worrying even less about the well being of Venezuelans who as far as he is concerned have betrayed him. In the Northwestern part of Amazonas State, not far from the Orinoco, you can visit the Autana mountain or Mountain of Life. The mountain is made up mostly of horizontal sandstone shields, mixed with karst, which is quite a strange thing, as karst shows up mostly in limestone formations. The Autana rises only 1250 metres above sea level, but it looks pretty impressive as the jungle around is rather flat. This is the beginning of the amazing Guayana shield, which stretches for hundreds and hundreds of kilometres towards the East. To the West and North, going over the Orinoco, you have lands that belong to the Llanos. The Piaroas are some of the main native American groups still living in this area. They speak a language that is completely unrelated to any other language but one. If the wishful thinking was for his health (he looks worse and worse) the insults were for the Inter American Court for Human Rights who gave him a major defeat yesterday. So he did what comes to him naturally, to a bully: I am not playing anymore, you do not exist "es un cero a la izquierda" (a Zero). That means, obviously, that the Luisa Estella's high court received its marching orders to decide ASAP, preferably while he is in Cuba, that the IACHR rulings are invalid in Venezuela. It is important to pretend that the court is independent: that is why it will most likely rule against the IACDH while Chavez is in Cuba. Luisa Estella must be busy this week end writing whatever comes off her arse. The threats were for the banks and bourgeoisie. Apparently if the private banks do not stop swindling "el pueblo" then he will nationalize them. Another stupid question if I may: if the banks are indeed swindling el pueblo why is there not some judicial proceedings against them? 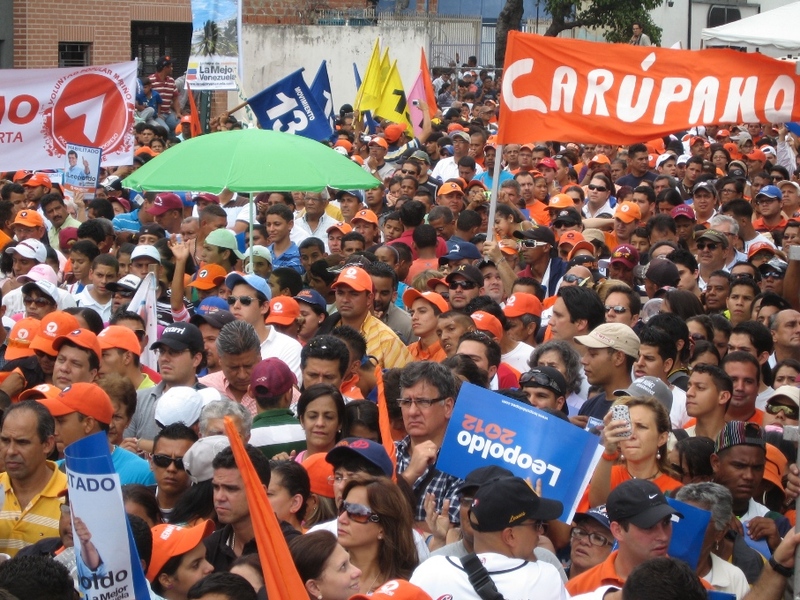 Is expropriation a mere form of economic "inhabilitación" a la Leopoldo Lopez? Empecemos por la contraloría de la república, reseñada en Prensa Latina que dice, por ejemplo, entre varias banalidades y mentiras esta perla de resumen: "En ese sentido, el texto de la Contraloría General manifestó que los hechos irregulares cometidos por López están comprobados y el inculpado no demostró su inocencia." ¡Pero es que Leopoldo López no niega los hechos! El problema es que él y medio mundo niega que fuesen crímenes ya que él no se embolsillo nada, y que el estado no ha demostrado que se cometió un crimen. Eso solo lo puede establecer un juicio formal y este nunca tuvo lugar. El siguiente ladrido vino con rapidez de la Fiscalía General de la república que nunca pudo, o se molestó en montar un expediente para llevar a juicio a Leopoldo López y la gran mayoría de los inhabilitados. La Fiscal nunca se paseo por esa inquietante, de que si hubo crimen, de que si se puede demostrar, de que si se merece castigo, de que si la fiscalía cumple con su trabajo por la cual pagamos impuestos y que por lo tanto, si no cumple, también debería ser inhabilitada la fiscal ya mismo, en este instante, por incapaz. En la Defensoría del Pueblo ya se ladró hace unos días. Y si no se ladró hoy es porque seguramente la defensora está mas preocupada por los derechos de cinco cubanos en los EEUU que por los derechos de millones de venezolanos. Todavía falta le ladrido mayor pero no se preocupen, que ya nos dio un anticipo con la ayuda del pillo de Jose Vicente. Pero seamos justos, también hay perros falderos ladrando. Y muchos(as) que faltan por ladrar. Actualizado: ya la Defensoría de Chávez, perdón, del Pueblo ladró. Ya cumplieron todos. ¡Tirales galleticas Hugo! Der Lateinamerikanische Gerichtshof für Menschenrechte hat sein Urteil bekannt gemacht: die Chávez-Regierung darf Leopoldo López seine politischen Rechte nicht mehr entziehen. Leopoldo López darf bei den 2012-Wahlen kandidieren - wenn die Chávez-Regierung internationale Menschenrechtsnormen respektiert. Schon davor hatte die Chávez-Regierung und die Richter des von ihr abhängigen Obergerichtshofs erklärt, dass sie darauf pfeiffen. Es stellt sich die Frage, ob sich Chavistas wirklich weiter isolieren wollen. Not surprisingly since it is a district taken for granted by chavismo, it is also one of the most neglected with extensive slums at each entry of the town (town for lack of a better word to describe a ramshackle of who knows what). Tuesday, the people from those shanties who probably do not pay for electricity to begin with, were incensed because yet another blackout had lasted for more than half a day. In the hot and humid climate of the area where no refrigerator can hold cool for more than a few hours without power, it was indeed a problem for these people, even if electricity is stolen by most of them. So they did the most sensible thing: they blocked the second most strategic road of Venezuela for several hours refusing to lift the barricades until power was restored. That trucks and drivers also suffer from blackouts was apparently of no concern. That they could have set seat in front of Matson' offices either did not come to mind, or was too far to walk to, or simply they did not want to jeopardize the occasional free Mercal bag. Almost done! No more oil shortage for Moron! Sure enough, when the night set, they started pillaging the trucks, women and children giving a helping hand to the males of the pack. For good measure many cars stuck for hours in a road which was blocked both ways were also relieved of wallets and cel phones. Shooting was heard but no report on its results. Twitter was aflame last Tuesday I was told, in the twitter traffic addresses. The Carabobo state police is the only one that showed up, woefully outnumbered. 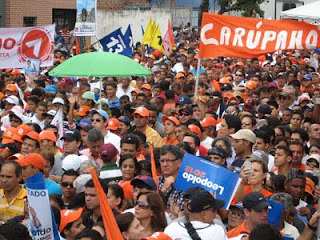 No Nazional Guard was seen, even though any opposition rally is quickly surrounded by it in massive shows of strength. See, el pueblo is allowed to pillage. What else can we deduct? Suiii, Suiii, stealing pigs on motor bike barefoot! That is what 12 years of chavismo did to the country, a descent into anarchy and barbarism. While now I need to make sure that I always drive through that area before noon..... because the could have been me is the piglet there, as we are all in Venezuela now, sitting pigs/ducks wherever we are. And of course nothing on the state news..... It is all a media manipulation and all of these people are paid actors.